Ready to give your old knotty pine cabinets or paneling a new look? Bleaching can give dark-stained knotty pine or even lighter pine pieces a brighter, fresh look. Bleaching can be a prelude to spectacular whitewash or stain treatments that completely change the appearance of your kitchen or living room. Keep in mind that wood bleaches are caustic and must be handled with respect. Always read the instructions and package warnings on the wood-bleaching product you choose before you start working. Work in a well-ventilated area, with windows open and fans running if possible. Keep in mind that the bleach can damage any surface it comes into contact with so choose your work area carefully. Wear protection, including gloves, long pants, long sleeves and goggles, to prevent personal injury. A dust mask should be worn when you use oxalic acid. Avoid using a metal container to hold your bleaching product as the bleach can damage it. Glass and ceramic containers are safe to use. Apply the bleach carefully to keep it from splashing onto your bare skin or other surfaces you want to protect. 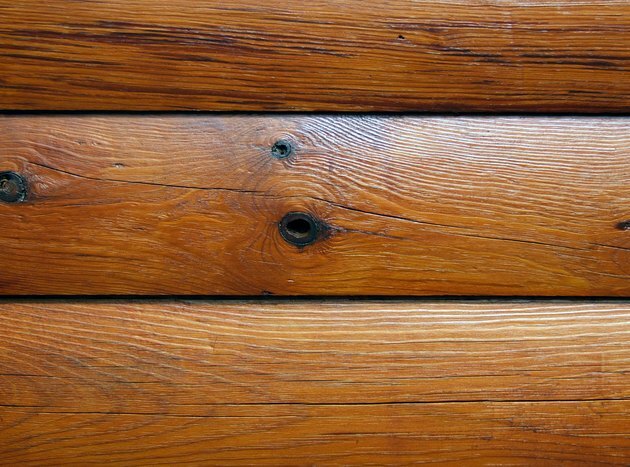 Ultraviolet light from the sun can do a pretty good job of bleaching the natural colors from pine, but there's a faster way to do it that doesn't leave a gray surface coating of dead wood cells. A two-part bleach consisting of sodium hydroxide and hydrogen peroxide does just that, and you can apply it more than once to make the wood progressively lighter. If you're more concerned about removing dyes left from juice spills or ink, then you need chlorine bleach. Use oxalic acid to bleach out dark stains created by reactions between the wood and minerals in water that have penetrated the grain. 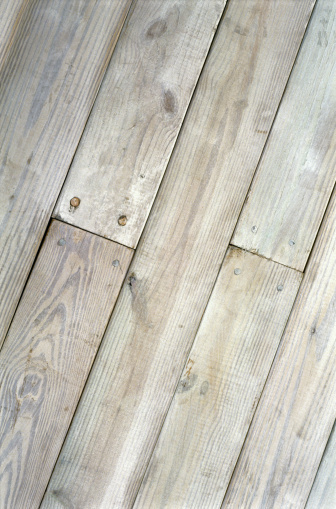 Oxalic acid also restores the natural color to wood that has turned gray from exposure to sunlight. You can only bleach unfinished wood, so if you want to lighten your wood knotty pine paneling or cabinets, you probably have an extensive stripping and sanding session in store. Dismantle as much of the woodwork as you can to make this job easier. If you're bleaching pine wood cabinets, remove the doors and all hardware. If you're bleaching walls, take down all the trim. Rinse well after stripping, and let the wood dry before you sand. Knotty pine paneling frequently has deep grooves, and the fastest way to remove the finish from them is to sand them with a rotary tool and a detailing brush, which looks like a paddle wheel made of sandpaper. The wood may not have dye or water stains, but if it does, it's best to bleach them out before lightening the wood color. Mix a saturated solution of oxalic acid crystals and water. Paint this solution on dark wood stains and gray wood. Once the stains or the grayish tint is gone, neutralize the acid by rinsing with a baking soda solution. To remove dye stains, brush or spray liquid chlorine bleach on the stains and let it dry. Repeat the procedure twice more if any color remains. After that, further bleaching will be ineffective. Two-part wood bleaches for lightening the natural color are readily available. They consist of a part A, sodium hydroxide, and Part B, hydrogen peroxide. You can sometimes mix the parts before applying the bleach, but it depends on the product, so read the label. If mixing isn't recommended, sponge on part A and follow it immediately with part B. Don't wait, or the sodium hydroxide may darken some parts of the wood. If the product calls for mixing before applying, wait until you're ready to bleach the wood. It's best to use it right after mixing. You'll probably only need to bleach once, but you can do it again if you want a lighter color. This bleach is alkaline, so wash the wood with a weak acid to neutralize it. A 1-to-2 solution of vinegar and water works well. 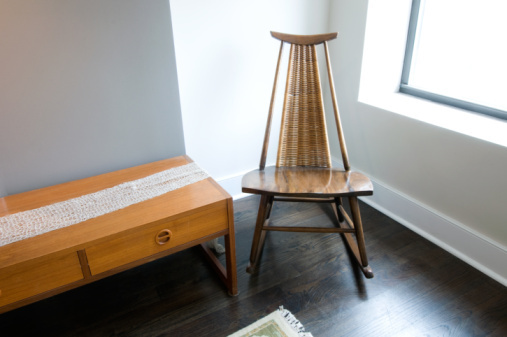 Bleaching pine wood is an effective way to remove stains and refresh the look of your wood piece. Follow safety precautions no matter which type of wood bleaching product is ideal for your knotty pine panel board, furniture, cabinets or other pieces.